The VSU Choral Department offers a wide variety of opportunities for students to participate in music making, an enriching experience that complements your education, no matter what your major area of study may be. Students from all over campus can find their voice in one of our four different choral ensembles. With almost two-hundred singers and growing each year, the choral area presents the best in vocal ensemble singing. Please use our contact form if you want more information about the choral programs at VSU. 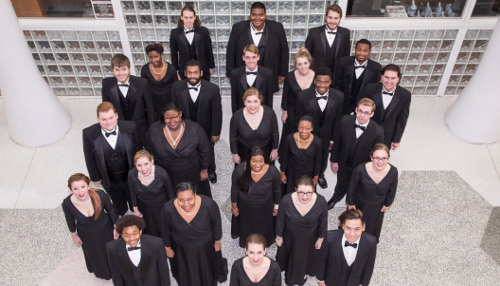 The Valdosta State University Concert Choir serves as the largest vocal ensemble on campus performing several times throughout the year, including large-scale works with the Valdosta Symphony Orchestra. Noted for its innovative and versatile programming the singers pride themselves in singing challenging and diverse choral repertoire from all historical eras and many cultures. Although the choir is the principal ensemble for vocal majors, over 40% of the singers are from fields of study other than music. They share an ability and love for music, especially singing. If you have a musical background, such as church choir, middle or high school choir, instrumental experience, or perhaps you just want to learn to sing, then come and be a part of the Concert Choir. You will meet people from virtually every major academic discipline, continue your vocal development, and build lasting friendships and memories. Recent works with the Valdosta Symphony Orchestra include: the Requiems of Mozart, Faure, Brahms and Verdi, the Ninth Symphony of Beethoven, Orff's Carmina Burana, Missa Solemnis by Beethoven and a complete performance of Messiah by George Frederic Handel. During spring of 2009, the Concert Choir performed Arthur Honegger's King David with the Valdosta Symphony Orchestra, both in Valdosta as well as the Cathedral of St. Philip in Atlanta, Georgia. The VSU Chamber Singers is comprised of 18-30 singers who are chosen for their vocal and sight-reading abilities. The ensemble specializes in chamber music ranging from the Renaissance to the present. Every year the VSU Chamber Singers present a unique holiday performance in the West Hall Rotunda and frequently join with the Concert Choir and the Valdosta Symphony Orchestra to present large-scale works. The Chamber Singers have performed at the Regional Conference of the American Choral Directors Association in Winston-Salem, NC (2012) and toured England during the Spring 2014. Students receive one-hour credit and meet Monday/Wednesday, 12:00-12:50 PM and T/TH 12:30 - 1:45 pm. [MUSC 3810A, CRN: 81749]. Auditions will be held the day prior to the start of classes as well as the first day of classes. Sign up for an audition time on the choir room door (FA1032) or contact Dr. Klement at 229-333-5812 or daklement@valdosta.edu. The Valdosta Symphony Chorus is comprised of university faculty/staff and community members, and serves as an extension of the choral department. Typically, the VSO Chorus joins with the Concert Choir and Chamber Singers, and performs regularly with the VSO in major choral orchestral works such as the Beethoven's Ninth Symphony, Verdi's Requiem and Orff's Carmina Burana. The VSU Spotlighter’s is a select ensemble of 8-12 singers chosen by audition from the Chamber Singers. This ensemble specializes in popular, jazz, blues, and show tune repertoire. This premier ensemble performs on and off campus for a variety of audiences. Auditions are held from 6:00-9:00 PM on the first day of classes. Sign up for an audition time on the choir room door (FA1032) or contact Dr. Klement at 229-333-5812 or daklement@valdosta.edu.